To say my mom is obsessed with holiday meals is a huge understatement. This past Thanksgiving she made two turkeys, so she could have Thanksgiving leftovers for at least days and maybe even weeks. By the time Christmas came around, I think she finally finished her Turkey Day leftovers because in addition to our normal gift exchange, she also gifted me a 10 lb ham. Being a foodie, I couldn't reject the gift, but my mind started turning a hundred miles a minute trying to think of recipes to use all the ham without eating ham sandwiches for 7 days straight. 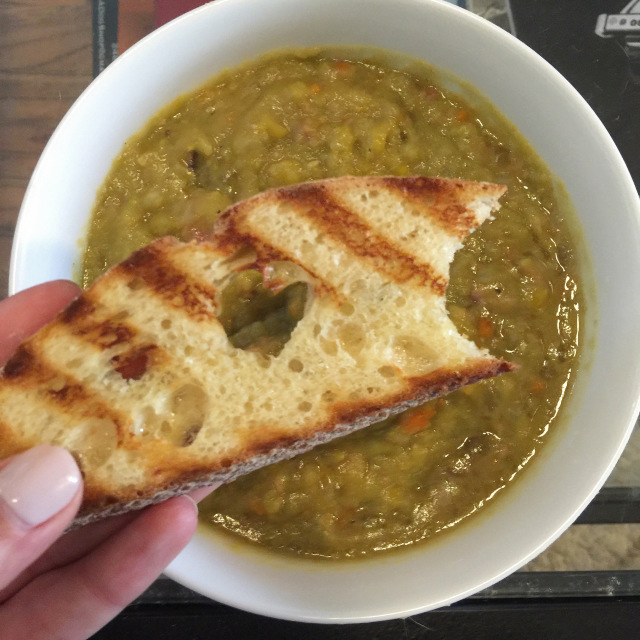 I've always been a soup lover, so I figured why not whip up a simple crock pot split pea soup, loaded with yummy ham bites. And let me tell you, this soup recipe could not be any easier, it takes maybe 10 minutes of prep and maybe a stir once an hour, if you're feeling up to it. It's the perfect rainy day meal to set and forget. Place all the ingredients into your crock pot and cover with water. Cook on high for 6 to 8 hours stirring occasionally until peas break down and soup becomes very thick. Add additional water to bring soup to your desired consistency.